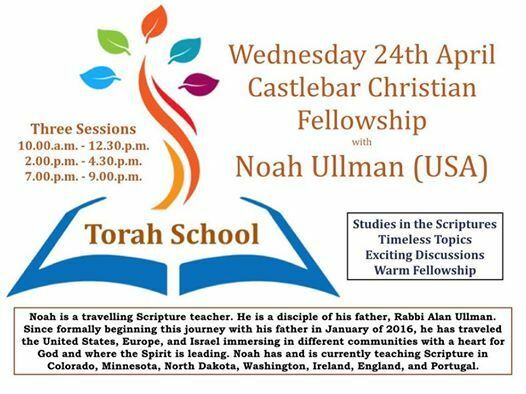 You are very welcome to join us for Torah study with Noah Ullman (USA) on Wednesday 24th April. Noah lives in Boston and is a travelling Scripture teacher. Since formally beginning this journey with his father Rabbi Alan Ullman in January 2016 he has travelled in the USA, Europe and Israel. Noah will lead us in an interactive bible study based on the Hebrew concepts and language. It is an enriching way to explore the scripture, getting deep into the meaning of the Hebrew roots of words showing us the true meaning of the Word in the OT and show us how it links into the NT. Wednesday 24th April There will be three sessions. We will take a love offering for Noah, and as a guideline would suggest €15-€20 per person (for those in a position to do so) to cover costs.